On March it ended the support jobs of the new road that is being built between the Regales and Avda. Iparragirre streets in Santurtzi. This path is part of the development works of the AOR-402 sector that stands out as it is the natural expansion area of the town from the west. 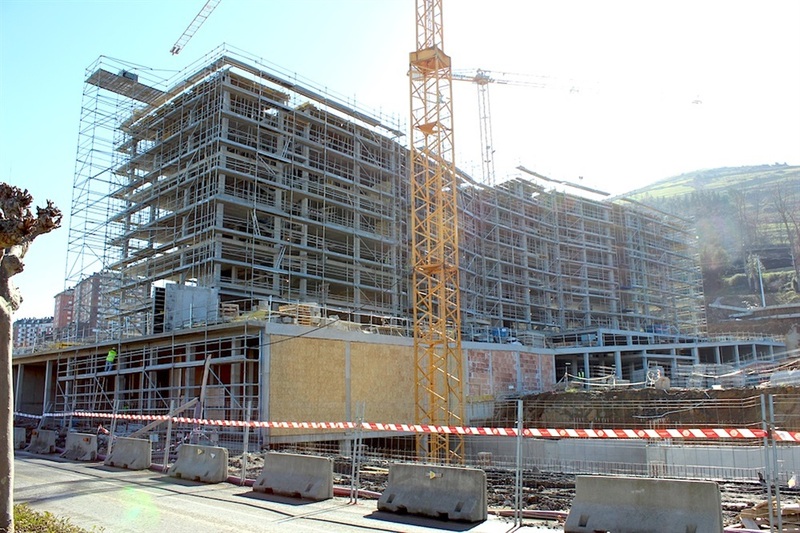 In this sector, it is also found the “Itsasalde” residential building, whose works, also led by Viuda de Sainz, are progressing well. The building, which will house 111 state-subsidized apartments, consists of ten floors, two basements for garages and for storages, plus a commercial plant around the front overlooking the main street (Avda. Iparragirre). Divided into four portals, including the common areas and the proportionate share of garages and storages, this construction has two facades, with a solution of honeycomb ceramic, acoustic carpentry and insulating treatment façade which gives the building an energy rating “B”. In its conception, there are integrated the eco-design parameters. In short, it will begin the second phase, consisting of the execution of another residential building of 10 floors plus two basements, with also a commercial plant, which enables a set of 89 priced protection homes divided into three portals with similar characteristics to the building in construction.